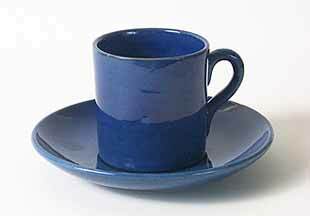 Blue cup and saucer - 2½" (63 mm) high. Thomas Brannam started on his own, after having worked for some years as a potter, in Barnstaple, Devon, in 1847. The company originally made utility wares such as floor tiles and sewage pipes. The name most usually associated with Brannam is that of Charles Hubert Brannam, Thomas's son, born 1855. Charles started work at the pottery at the age of twelve. He was artistically inclined, and after many years trying, managed to persuade his father, in 1879, to let him experiment with the production of art pottery at their Litchdon Street works. In the following decade a London outlet was found for the wares, which were known as Royal Barum Ware, and the company soon established an enviable reputation. It is true to say that they were patronised by the crowned heads of Europe, and that included Queen Victoria. Fine wares continued to be produced well into the twentieth century, but after C H Brannam's death in 1937 the emphasis moved away from art pottery back towards plainer domestic wares. Brannam pottery is widely collected and due to the company's long life - they are still producing pottery today - something can be found to suit every collector's pocket. Many marks have been used over the years, mostly using combinations of 'C H Brannam', 'Castle', 'Barum' and 'Barnstaple'.